I had this posted on my facebook page today. I thought it was too cute. 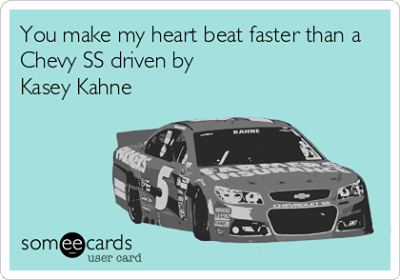 Kasey is my favorite NASCAR driver. I thought I would share it here. Just as I was about to post to my blog on Wednesday we lost power. We had very cold weather and an ice storm that put 21,000 people without power. It came back on today at 11:50. I was in the car charging my cell phone when Gary came out of the house to tell me the power had just came on. Gary and I engaged in conversation. It’s amazing how much you can say to each other when there are no distractions. Then I read. I have several books on my tablet. Well I read until the battery drained. Then I got my nook and read it until I had no battery. The last thing with juice in it was my i-touch, I then used up that battery. I have several movies on the laptop, so we watched Disney movies until the laptop died. Finally last night we had no computer, no phone, no laptop, no nook, no tablet…we had exhausted topics of conversation. After all we have been together for over 40 years, so I went to bed. Gary decided to sit up a bit longer. Bandit, our Toy Fox Terrier snuggled up with me in the bed. It was nice to have the warmth he provided. Anyway, while I was in bed I began to realize how much we take for granted in this life and how blessed we really are. God has given us the ability to have so many things. The ability to invent so many things that make our life better, safer, and more comfortable. I wonder how many times we remember that everything comes from God and how often we remember to say thank you. How often do we use these gifts to help others? How many times do we just turn and look the other way? While I was thinking about all this, St. Therese of Lisieux came to mind. She is the saint of the Little Way. Following her Little Way we can give thanks to God and help our neighbor while doing the everyday tasks of our life and offering it up to God. I have always been Catholic. Always loved God. But I admit that I didn’t always put God first. Even with all the blessings He has given me through my life. I haven’t always acted like a Christian. I often have been short tempered, judgmental and selfish. Now that I am older, I see that I have wasted a good bit of my spiritual life. I have become enthralled by my faith. I am learning so much that I never knew and I thank God for this. Next I Can’t Wait For Spring!